Ethereum [ETH], the third biggest cryptocurrency by market cap, is currently the center-point of the cryptocurrency space because of the recent comments made against the project by Tuur Demeester, the Founder of Adamant Capital. 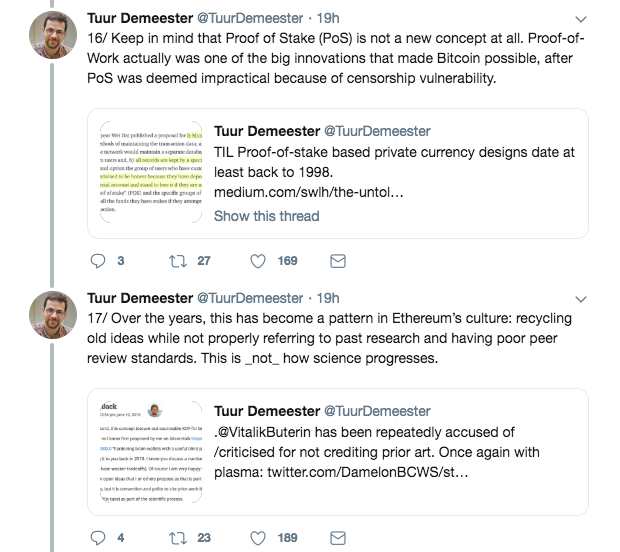 The Founder outlined the reasons he is against the leading project on his official Twitter handle, which resulted in gaining the attention of several well-known influencers in the space. This was followed by the Founder stating that he has been following up with Ethereum since 2014 and that it is his responsibility to share his “concerns”. 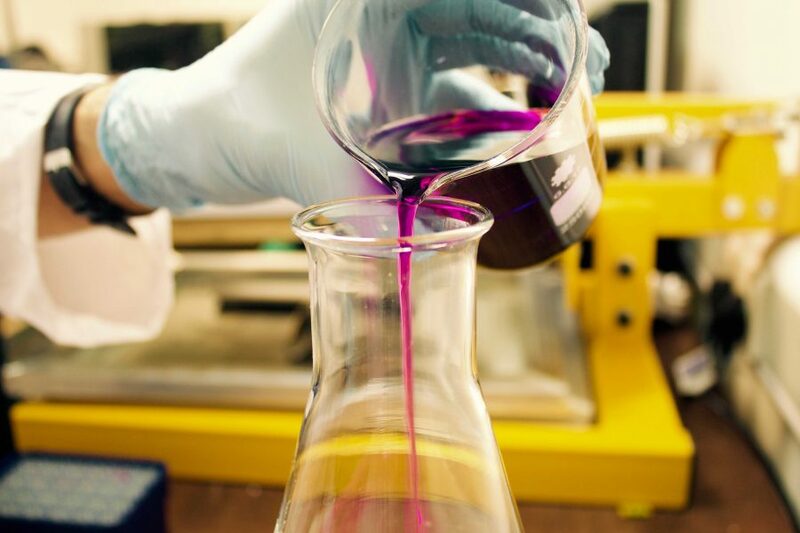 According to him, the third biggest cryptocurrency “is at best a science experiment” and the current valuation, i.e., $13 billion is too high. 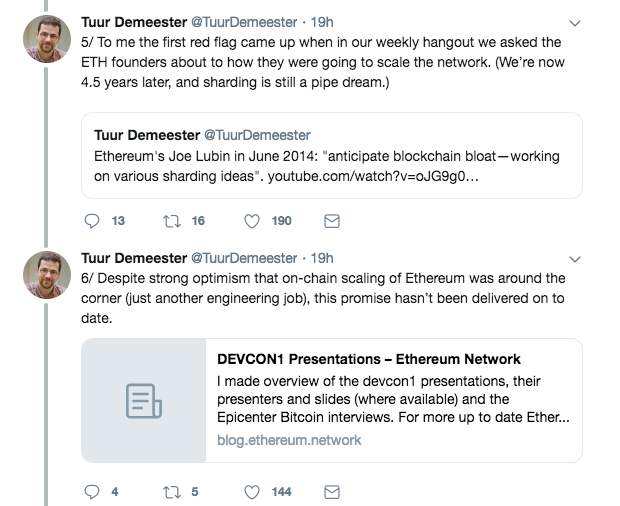 Following this, Demeester remarked that he is in complete agreement with the statement made by Vlad Zamfir, an Ethereum developer’s statement made in early 2017. Here, the developer had stated that Ethereum is neither safe not scalable, but was merely an “immature experimental tech.” The developer had even advised people to not work on the network for mission-critical apps unless absolutely necessary. Additionally, the Founder also pointed out the criticism made against Casper’s white paper, stating that “it does not live up its own claims”. The peer review was conducted by a group of developers including Vlad Zamfir, wherein he states that the white paper does not result in neither the “theoretical sound nor practical useful treatment of Byzantine fault-tolerance”. It mainly points out that it is unclear whether the definition of Casper protocol family “provides any meaningful safety guarantees” for the Ethereum blockchain, or whether this approach could be applied to scale blockchains. He went on to say that his main concern is that “sophistry and marketing hyper” are the main factors contributing to Ethereum’s success so far. The Founder added that the overly “inflated expectations” has resulted in an “inflated market cap”. Ethereum [ETH]’s movement on the cryptocurrency charts has been termed ‘slow’ or ‘unresponsive’ by many people involved in the world of digital assets. This subtle attack on the Vitalik Buterin co-founded network has been a prolonged process with many betting on the “death of the Ethereum network” due to the rise of faster and more efficient technologies and blockchain networks. The second largest cryptocurrency, however, seems to have taken all these comments in stride as new data emerged that 6 of the 10 highest usage days in Ethereum’s history occurred over the past 3 weeks. Data from Etherscan.io showed a rise to a peak as Ethereum recovered well after the downturn in mid-January. The astounding peaks in terms of usage were also made evident when compared to the usage data in December/January 2018, the time period when the cryptocurrency market had reached its all-time high. However, Ethereum’s competition, EOS and Tron are not far behind. Just recently Tron, the Justin Sun-led cryptocurrency had announced that the TRX mainnet had crossed 2.5 million accounts, beating Ethereum with 8 million blocks. Ethereum, despite having the chronological advantage, had only 7.5 million blocks.